The last three months or so have made up a new and exciting phase in my New Zealand adventure. I finished semester one in December and I’m just starting semester two now. Most year-long exchange students have to at some stage answer that nagging question – will I go home for Christmas? In my case I decided to stay down under. It certainly wasn’t an easy choice, especially as I miss my friends and family so much, but in the end the cost of flights and the desire to make the most of my time here won me over. Part of me has been missing home cooking, winter weather and family traditions, but spending this time abroad has allowed me to get involved in new traditions and create new experiences that I will remember for the rest of my life. Hot-chocolate, scarfs and gloves have been replaced my barbecues, sun lotion and flip flops. Unfortunately most of my friends from university halls were only doing a semester exchange so they left before Christmas. Instead of moping around in an empty apartment building I decided to do something completely different and registered on a home-stay site The site links up international students with Auckland families who are looking to rent out a room in their house. I visited a few homes but in the end found one that was perfect for me – a nice quiet location on the edge of a forest with a family of four (with two really sweet little girls). Although I’m glad I stayed in halls for semester one as I was able to easily meet other students, I would also strongly recommend the home-stay option to anyone going abroad. When you’re boarding with a family you don’t need to worry about bills and grocery shopping and it gives you a chance to really get to know the local way of life. At the same time as I was looking for a place to live, I was also busy job hunting. I got a lucky break as the woman I was staying with was able to set up an interview for me at the museum she worked at. Fortunately I got the job and it has probably turned out to be the best job I’ve had yet (it beats restaurant work anyway!). 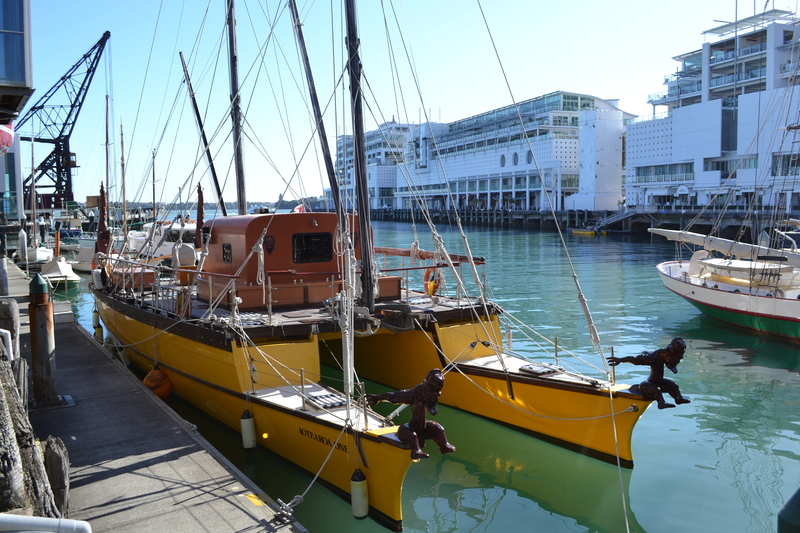 I work at the Voyager New Zealand Maritime Museum [http://www.maritimemuseum.co.nz ] and my job involves being out on the waterfront chatting to people, giving directions and taking/selling photographs of tourists going out on the harbour sailings. 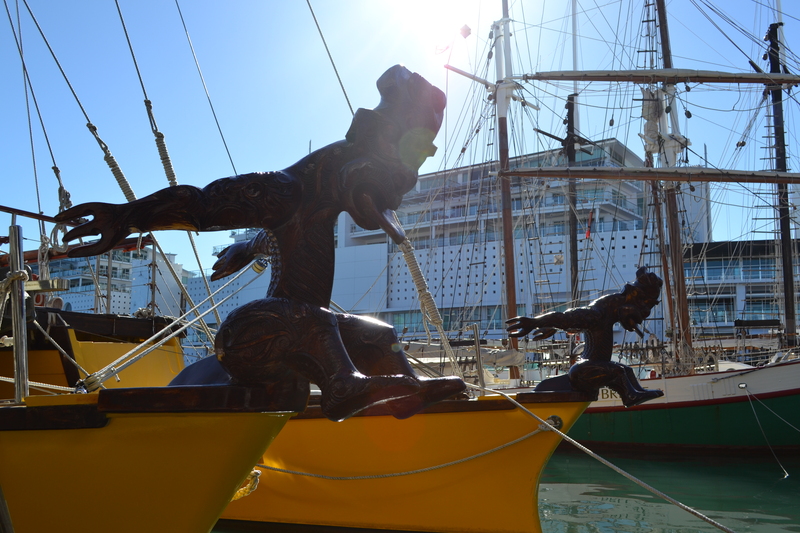 On my first day I got a tour of the museum and a free boat trip in the sun – it was pretty sweet as far as first days go! Even though (as with any job) some days drag on, most days are great as everyone who works there is really nice and I also get to meet and talk to tourists from all over the world. There is also the office view… I get to sit out in the sun by the boats looking out over the harbour. Can’t really complain about that! My Office view. This is a traditional Waka – a polynesian voyaging canoe that is similar to what Pacific Islanders would have first used to first come to New Zealand. Before I moved house and started at the museum I went down to south island with some of my friends from halls to go on a sea-kayaking trip in Abel Tasman National park. This was an incredible experience and unlike any other holiday I have ever been on. We packed up some food and supplies and headed off down the coast for three days. It was essentially blue skies, lush green mountains and white sandy beaches. Most of the time we were paddling about 100 yards from land but sometimes when the tide was high we would paddle into a lagoon to check out the valleys. On the last day the sea suddenly turned rough. Trying to paddle along the infamous ‘mad mile’ and feeling like I was going to be engulfed by massive swells was a little bit scary at first but was actually a real adrenaline rush. Our accommodation was a lodge with no electricity or showers but home comforts don’t really matter when you’re slap bang in the middle of paradise. On the calm days we kayaked alongside seals who were jumping out of the water like dolphins and for dinner one night we dove for mussels and cooked them fresh in the fire. The whole thing was so idyllic and beautiful that I felt like I was in the middle of some New Zealand tourism advert. It has encouraged me to sign up for the university kayaking club next semester so hopefully I will be reporting on some pretty similar experiences soon! Next postTrips, Travels and Adventures!